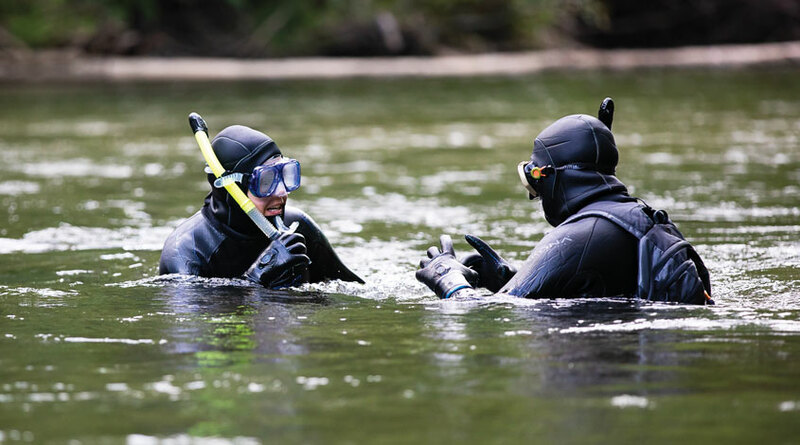 Kevin and Christie Merrill want to let you know why your next Western North Carolina outdoor adventure should be river snorkeling. For that last one, I can say that, no, you can’t really compare ocean to river snorkeling because they are two completely different experiences that have their own thrills and distinct ecosystems to explore. And sure, river snorkeling doesn’t come with palm trees or the array of tropical colors found on and around a coral reef; yet some of the 45 available fish species in this area certainly have brilliant swipes of colors (like the male river chubs’ streaks of blue) and funky silhouettes (like the sculpins), and many sections of the river were crystal clear. I certainly can’t wait to go again, and it was truly fascinating to see so much life teeming below the surface.